2) August and early September may be a bit hit or miss on the blog front. Summer camp ends today, and it will be me, twins, and dogs for the foreseeable future. Lots of time for playing in the front yard, going to wading pools, taking the dogs on walks, and maybe even some time for knitting and spinning as I watch everybody. All work or email responses happen at night, when the Professor is home, or in between adventures...please forgive any delays. 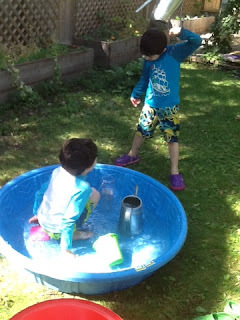 If you're curious about August is like over here, feel free to check out the blog archive...yes, the boys are now seven, but I suspect the sunshine and games will be mostly the same.